Camiel Boomsma: “Musings’ signifies dreams, reveries, being immersed in thought. It’s the process that the composer experiences while writing the work and also what I experience when studying and performing this music. As I play, I try in turn to pass on this process, this quest for insight, to my audience. Despite the major differences in musical background, these two composers are remarkably close in spirit. The most important aspect here is their ability to create beautiful, balanced melodies on the piano. They make the instrument sing more than anyone else. This was perhaps an obvious way forward for Schubert. As the composer of more than 600 songs, the art of the song was intrinsic to his very being. Chopin was on a par with this in his own way, since much of his music is fundamentally vocal in conception. While Schubert based his work on German Lieder, Chopin was inspired by Italian opera from the early 19th century." Wat een begaafd pianist!! Hopelijk gaan jullie nog veel cd's met hem uitvoeren! "It is winter and this is music to enjoy with a good glass of wine and a crackling wood fire. The musings come naturally." "Listening to the interpretations of Camiel Boomsma, a 27-year-old Dutch musician, one has the impression of being faced with accomplished piano art and remarkable maturity. Here is his first record for the Challenge Records label, which is a great opportunity to get acquainted with this promising soloist." "Listening to the interpretations of Camiel Boomsma, a 27-year-old Dutch musician, one has the impression of being confronted with an accomplished piano artist with a remarkable maturity in terms of playing. This is his first recording for the Challenge Records label. What a great opportunity to get to know this promising soloist! " "It is through the sweetness of the gesture and an unusual palette of dark colors that Boomsma plunges the listener into a very contemplative and cunning universe.The melancholic climate does not stop at all with the interpretation of the third movement of the sonata, the Scherzo: Allegro vivace con delicatezza, whose characteristics here are reminiscent of a nostalgic lamentation. " "The excellent sound of Piotr Furmanczyk is the icing on the cake.In short, a beautiful album, whose presence in our collection should enrich the knowledge of the offered works." 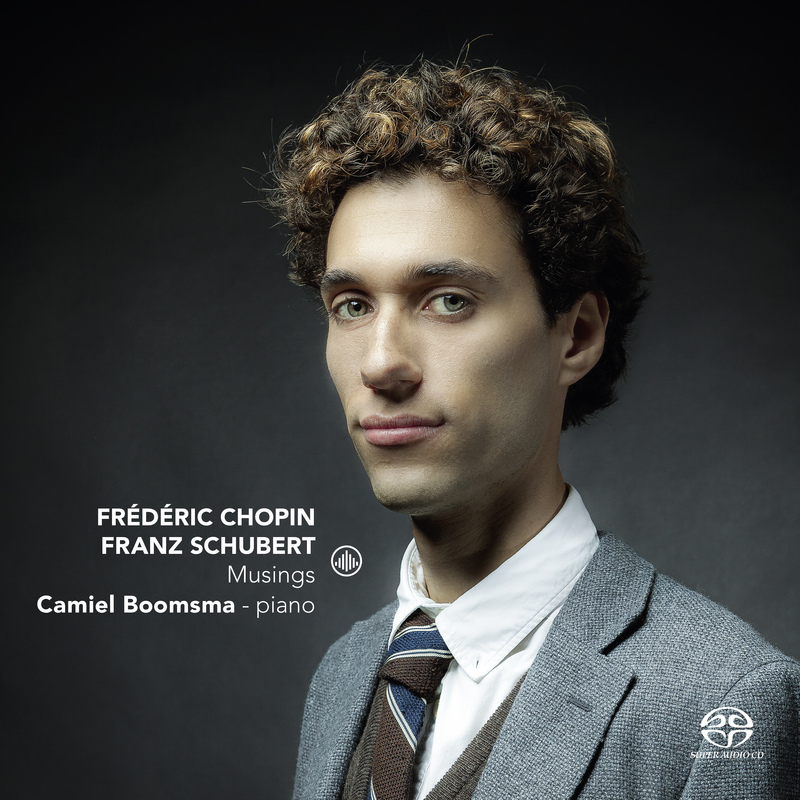 "The new cd by Camiel Boomsma opens with the warm and dreamy sounds of Chopins Nocturne, opus 9 nr. 1. The young Dutch pianist plays improvising and the melodies flow naturally from his fingers." "Just for the revelation in the seventeen transcendental dimensions, but also for numerous other musical reasons this subtly incorporated SACD should not be missed by music lovers." "This CD is one of the musical surprises of the year." "Sensitive and profound is the playing of Boomsma focusing on telling the musical story." Compare Boomsma's view of Schubert's 21st piano sonata with that of the Polish piano God Krystian Zimerman (also just released) you know that it cannot be ignored. Zimerman plays brilliantly and sterile, with Boomsma the notes flow philosophically. Zimerman sometimes goes like bang, bang, bang, Boomsma has got velvet attached to his fingers. Where the Pole speaks of willpower and ambition, the Dutchman speaks of acquiescence and death. "Musings by Camiel Boomsma is this week the NPO Radio 4 CD of the Week."